Forty eight hours ago in this same box that you’re reading, I wrote about Anthony Regis. 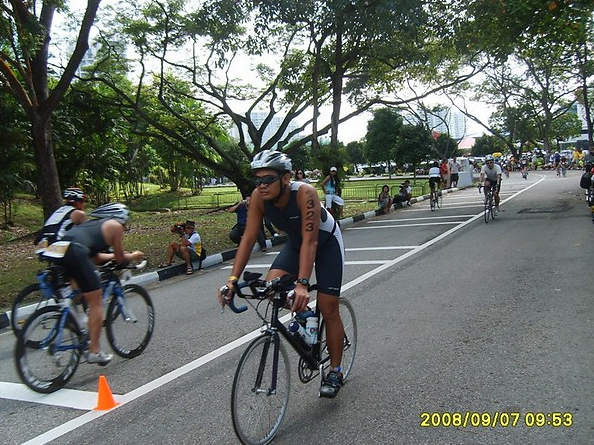 He’s a swimmer-turned-cyclist-turned-runner who, last September, joined the Singapore Ironman 70.3. That’s a grueling event where you swim 1.9 kms., bike 90 kms., then, when your body is downtrodden and all-wearied, you run another 21,000 meters. “The bike leg was 90 kms. in 3 loops. My plan was simple: Target was to average somewhere from 25 to 30 kph and to take it easy. The bike route was a flat and fast course and the winds were tough but the scenes were awesome! I tried to ride my bike as speedy and relaxed as I could but, in reality, that did not happen: I did not ride fast enough because I noticed several female triathletes passing me by! Boy, that felt funny. That’s okay, I told myself, I’m doing my best. The interesting—and painful—part of the triathlon is that, after you swim and bike, it’s not all finished. It’s not a two-sport undertaking; otherwise, it would be called Duathlon. With the Triathlon, a competitor always finishes with the run. “At the Transition Area (TA), I calmly mounted my bike and prepared for the 21 km. run,” said Anton. “I exited from the TA with eagerness to finish a 2.5-hour time. As I started running I felt my right knee in pain which left me no choice but to walk from time to time hoping for recovery. I picked up my pace every once in a while and tried to push some more but ended up in frustration. I realized that my mind and body were willing but my right knee was not. 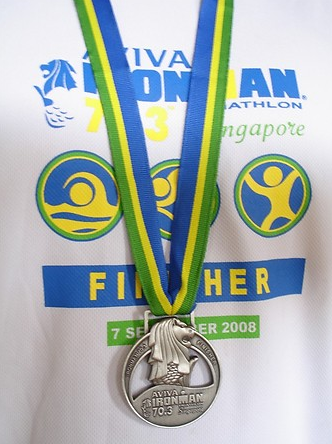 Then, in this event which few Cebuanos have accomplished—the Singapore Ironman 70.3 (the “70.3” connotes the number of combined miles of the three-leg triathlon)—Anton did the unthinkable. “I ran backwards,” he said. “Yes, backwards. As I did this to try and alleviate some muscle pain, another triathlete across the road heading towards the opposite direction followed my running style. He smiled and raised his hands with two thumbs up! I responded with the same two thumbs up and smiled. “About 4K to the finish line, I felt better and ran a little prouder and faster. With just a few meters to the finish line, I felt an indescribable feeling of joy and relief. It felt awesome! As I stepped onto the blue mat, the announcer screamed, “And… from the Philippines….. race number THREE-TWO-THREE…. ANTHONY…. REGEEEZ!!! “My run timed 3 hours and two mins. and my total time was seven hours, 35 minutes and 17 seconds (including time in TA). great job? at least you finished it.